My favorite time of year is spring. Especially when we have a spring like this one! Warm winter followed by warm spring means plenty of blooming flowers in April. By May we enjoy a true symphony of color! I’d like to share of few of our favorites with you. The bushes I’m showcasing for you are all reliable, easy care and gorgeous! If you are looking for some spring color and need some bushes to fill your yard; one or all of these may work great for you! We live in U.S.D.A Ag Zone 8. We are a wet, temperate zone. If you live in a different AG Zone, you may need to look up the zone hardiness for these plants. All of them have withstood strong N.E. Winds and temperatures down to zero. Wind chill brings it even lower occasionally. We have rather mild summers here. Mid 70s is our average. So if you’re really hot or really cold, look these flowering bushes up and see if you can grow them. This Tree Peony has huge white flowers. In the background a Rhododendron is blooming. Above the Rhody is a Viburnum bush just getting started. Viburnum are gorgeous bushes! But mine are not blooming yet. I highly recommend them if they grow for you!These three bushes will bloom well into May. You can see other peony bushes, not the tree variety, in bud. They will bloom a bright pink or red in Late May through June. Our peonies were a gift, over time, from my mom. She had a professional gardener friend that came up with orphaned peonies and lots of other trees and plants, that needed re-homing once in a while. She dutifully drove them up here from Seattle, where she lived then, and we found them a place in our yard. Now we have two colors of tree peony and oodles of red and pink bush peony. We love them! Gorgeous bushes! Our red Tree Peony is just about done blooming. We enjoyed it so much in April. It’s among our very first bloomers. We look forward to their enormous blooms and cheerful display in April. Peonies love it here! I highly recommend them if they grow in your zone. Peonies come in many varieties and colors. All of them grow from rhizomes. Peonies transplant easily. They even transplant themselves. Many of the peonies we have, volunteered as starts from the mother plants. We just dig them up and find them a home! I love peonies so much I just went out and bought my daughter two starts for her College graduation celebration. We both adore them. Now we have two more colors to share back and forth between our yards! Peonies are heavy feeders. For the best blooms and plant health, Alaska Fish Fertilizer works wonders! I hope you plant this wonderful spring bush. Pollinators love them! 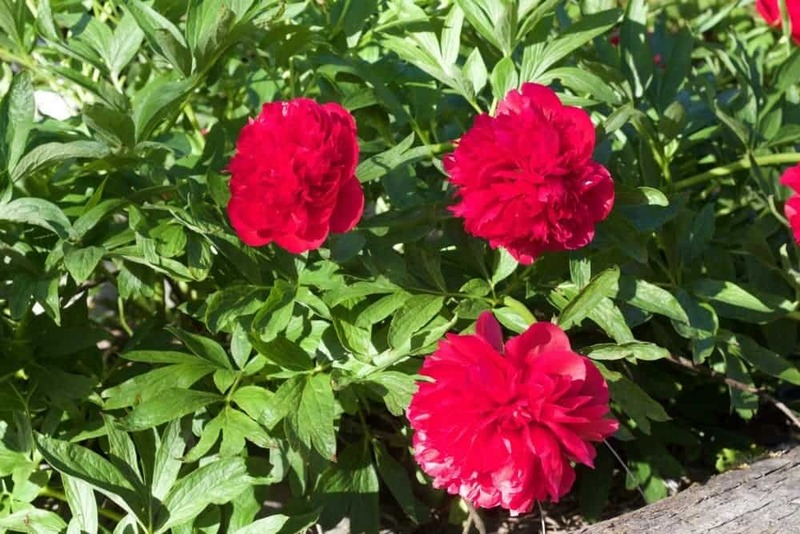 Pictured above is a bush peony in red. Unlike the tree Peony, this one grows low to the ground as a bush every year. In winter it dies back to ground level. We know it’s spring when we see these starting up from the ground! You can see the red bush peonies just starting to bloom in our driveway flower bed. These are fairly young peonies. Some get four feet or more high! The white rhododendron is discussed later on in this post. East to grow and so easy to start new ones! Lilacs bloom around the first week in April depending on the weather. They will last several weeks. They smell heavenly! We have lilacs all around our shop and home. They grow so easily and send up new shoots every year! Fortunately we have a lot of room to plant them. They make such a welcome splash of color in the yard! We have the two colors you see here. There are others. someday, I want to plant a white one! What a beautiful contrast that would make! Like the peony; Lilacs have tree varieties and bushy types. This light-colored lilac is the bushy variety. It gets big but stays in a well-shaped bush. My darker Lilac is a tree form. It will grow up to 15 feet tall. The tree form will eventually get kind of awkward and leggy and break branches off in huge windstorms from its own weight. No worries! Lilacs are incredibly prolific. Many new shoots will grow up to replace any broken branches. To keep the tree form under control; an occasional pruning of branches is all that’s necessary. These lilacs were transplanted none too gently (Learn how to correctly transplant YOUR TREES AND BUSHES in this post), as huge bushes, by Dave’s tractor. They were in the way of his new greenhouse! Now they sit by the driveway. They add lively spring color to our fields behind them! Notice the new growth underneath them. Those are baby lilacs. Easily dug up and replanted anywhere. Lilacs are one of the toughest bushes we have ever grown! I have transplanted lilacs so many times at the worst time of year, in horrible conditions, to bad soil. They shake it off and keep on growing! My Grandma Cash gave us starts from her lilac 20 or so years ago. Now we have LOTS of lilacs. Love them all! The only care a lilac needs, except a shot of fertilizer very occasionally, is to be cut back so they don’t get too leggy. For a well-shaped bush, prune them. They can get enormous, if not divided occasionally. Another gift from Grandma! This Chinese Wisteria is a show stopper every spring. It blooms for several weeks. The bees are all over that vine on warm days. 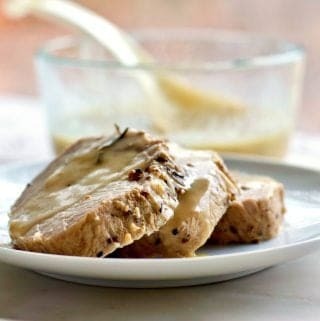 And it smells really nice too! The only challenge with a Wisteria of this kind is; It Gets HUGE! These vines can grow 90 feet long! In all directions! Wisteria sends out new shoots and runs new vines out from them. So they can cover a lot of ground. The one you see here, fortunately, is running along a fence surrounded by grassy yard. So I just mow the new starts down to keep the vine under control. This invasive vine needs trimming back every year to maintain a friendly status in your yard. It grows up onto our shop, into the grapevines and all through the bushes and trees. And it’s strong! We used to have an apple tree growing by it. The Wisteria got into that tree, wrapped it up so tight in vines that it actually pulled the apple tree over. The tree had a permanent lean. Eventually the poor apple tree fell over in the wind. Watch your wisteria vine. They get naughty! But believe me, if you have the room, they are spring flowering bushes you’ll love! 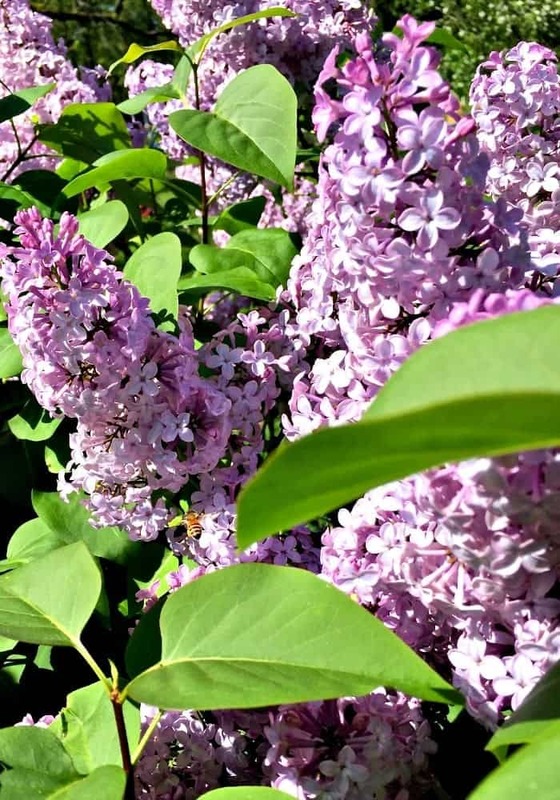 You will also love Forsythias, Pieris and viburnums for spring flowering bushes that produce early spring color year after year with little trouble. I have them all and they are fantastic early bloomers. They just are not blooming right now. This rhododendron was hybridized by a small nursery in our area. I love the delicate snapdragon look! One of the Spring Flowering Bushes you’ll Love! Rhododendrons are native to our area. In the wild, they live in forests, in the understory. Rhody’s come in all colors and sizes and thousands of hybrid varieties. Rhododendrons do require deadheading the spent blooms. 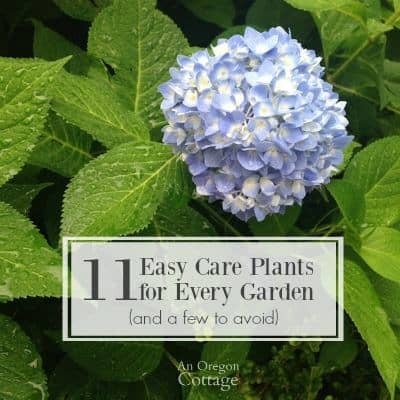 This helps the plant look better and have better blooms the following year. If you can grow Rhodies, I highly recommend you do. They make excellent privacy hedges too. These thick evergreen bushes are good for adding definition and structure to your landscaping. And once a year they are amazing in full bloom. Some get 12 or more feet high! We love our spring bulbs too! Tulips, daffodils, hyacinths, Iris all live here and bloom their hearts out in April. 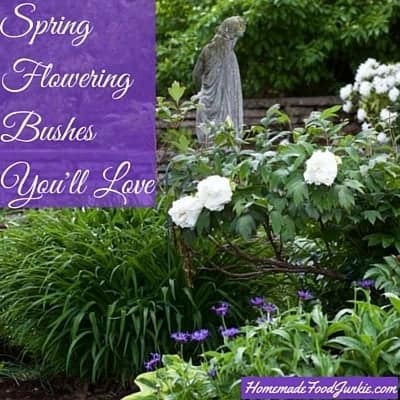 Today I focused on a few of our favorite spring-flowering bushes that you’ll love. I hope your yard is giving you joy! TUESDAYS IN THE GARDEN BLOG HOP! PLEASE CLICK THE LINKS BELOW TO VISIT OUR OTHER CONTRIBUTORS TO THE BLOG HOP. THEY HAVE SO MUCH TO SHOW YOU ABOUT FLOWERS IN THE GARDEN IN SPRING! I love your ideas! I’m excited to upgrade the flowerbeds near my garden. Thanks for the tips! You’re very welcome Margaret! Thanks for stopping by. I’d love to know what you do in your flowerbeds! I absolutely love tree peonies! I have yet to find a spot in my yard, but they are just gorgeous! My lilacs are just beginning to bloom and they smell heavenly. I had no idea some could grow up to 15 feet tall. That is amazing! 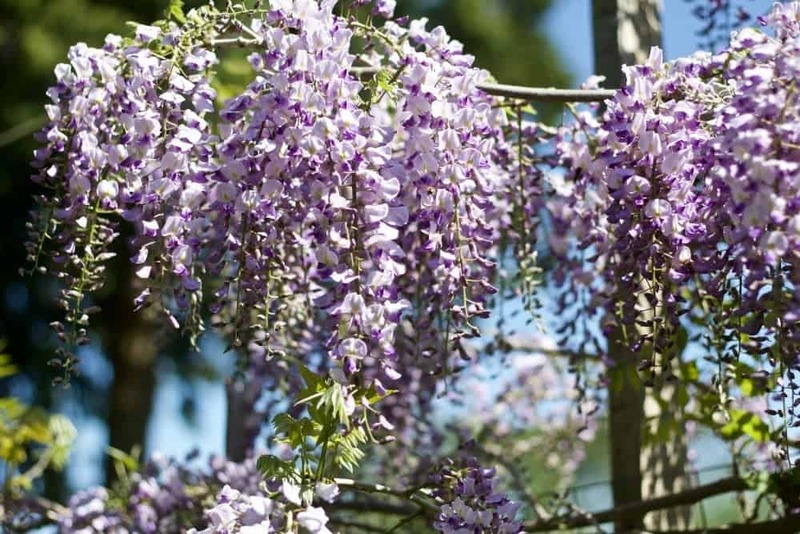 I’m really interested in growing wisteria, but I’m not sure where to plant it. I know it needs sun, and I’m intimidated by the size. I really want to take the leap though, and give it a shot. Speaking of rhododendrons, mine is super huge! Can’t wait to watch that bloom later this month! Great post, I’m definitely putting these beautiful shrubs on my shopping list. Hi Angie! Thanks for stopping by! We love a lot of the same flowering bushes I think. The Wisteria is a lovely vine. BUT there are varieties that at not as invasive as ours. 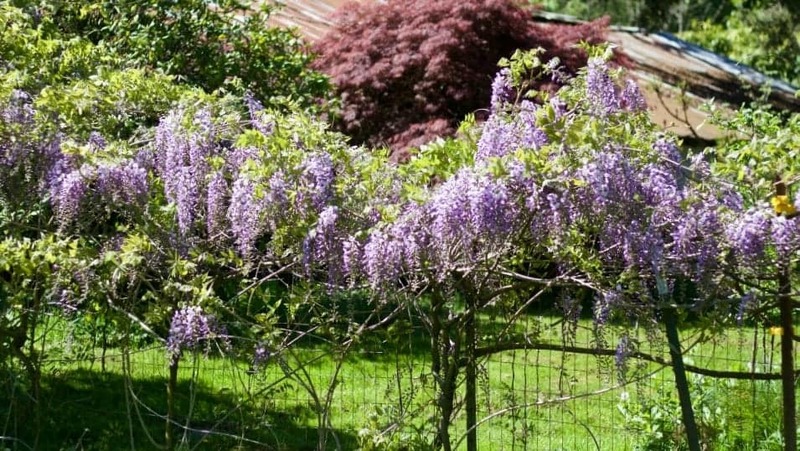 Here’s a link to a page that will show you some gorgeous wisterias that won’t take over a small yard. Otherwise I suggest you plan on a large pergola. Wisteria are amazing over patios too! Good Luck! I love all the bushes you shared! We had lilacs when I was a child, but don’t currently. I really want them back! And the azaleas too. Can’t wait to do some landscaping around here when the house is finally finished! Hi Michelle, Lilacs are a favorite of mine. I especially like the shorter bushier versions. Your house project is amazing! I can’t wait to see it all finished and landscaped! 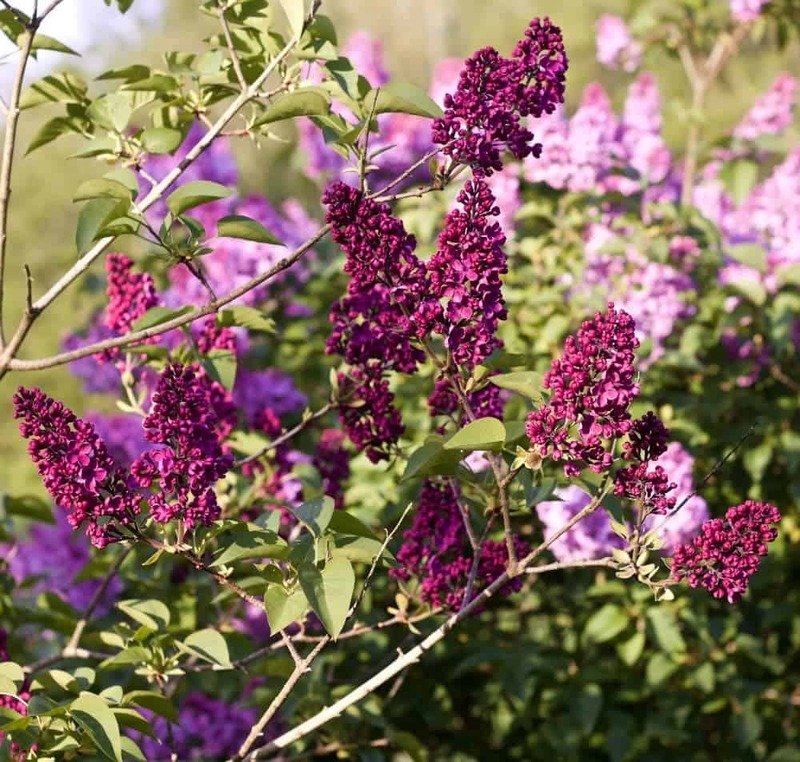 Lilacs are a good choice for an easy keeper bush. And they transplant well! I love how many of your plants have a story, Diane! Some of the peonys we have came from my husband’s grandparents, too, so I know how fun that is. I’m terrible at being able to grow your other plants (well I’m too scared to try Wisteria, ha! Too much upkeep for me…) – I’ve tried 4 times with lilacs before giving up. I enjoy them around the neighborhood, though! Wow Jami, I’m so surprised you have trouble with lilacs and astilbe. Our weather is not that different. It must be your soil. We have good luck with plants that love horrible heavy wet clay. you must have a lighter, drier soil. I do love to wander through the yard and remember my Grandma and mom when I see the flowers they have shared with me over the years. It motivates me to keep up the yard. 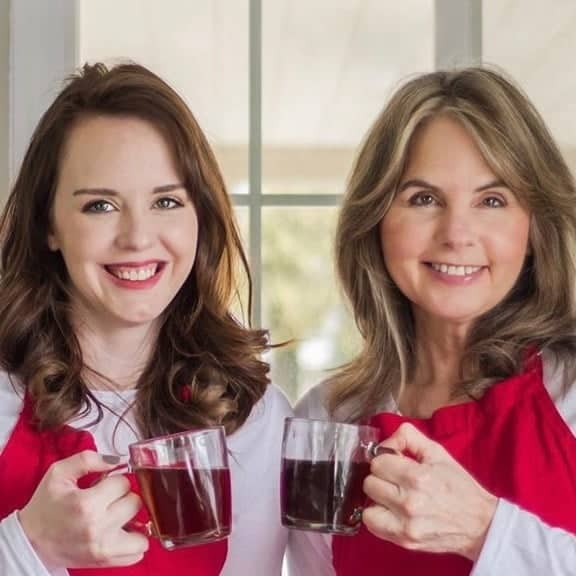 They were both amazing gardeners, well mom still is. Grandma passed a long time ago. Those memories are precious. So many great flowers. My grandma’s favorite flower was Lilacs. I wish we had room to grow one here but we really don’t. Maybe if one of our Rhododendrons dies off we’ll replace it with one. We have so many Rhododendrons in our garden from the previous owners. Peonies are also a wonderful flower that I would like to grow both my grandparents and my mom loved to grow them. Hi Shelly, Rhodys and azaleas are very popular up our way too. I love our peonies and lilacs. I’m so glad for their early spring color in the yard. If you ever get room I hope you give them a try!